I got up early enough to hit the highway upon sunrise. The morning dawned with crystal-clear skies and wonderful pastel colors. The air was so dry I could see the shadow of my Ford Taurus wagon riding 300 ft next to me across the flat farmland of North Dakota, just south of Fargo. Quite a sight! When looking at a map, my course was roughly a rectangle with four legs: First, straight south to Sioux Falls, about 250 miles (400km). Very long drives are a mental challenge, a mind game around hours and miles flying by. It all depends on your mindset. Usually you think: 250 miles - oh what a long stretch! But when you know you have to go so much further, it is all relative. Studying the map showed that the second leg is all freeway (interstate I90) heading straight West. It is about 300 miles to Rapid City. Just short of that is the first section of the Bad Lands National Park. The Bad Lands is an area stretching out for about 60 miles which seperates two levels of prairie. The two planes had been shifted differently by geologic activities and the fault line has been exposed to erosion for millions of years. This is what created the bizarre canyon-like slopes and pinnacles. Reminded me a lot of the Bryce Canyon NP or pictures I had seen of the Theodore Roosevelt NP. Some areas in the Bad Lands also carry a lot of sad history: At one spot called Wounded Knee there had been a bloody battle in 1890 between soldiers and Indians, who had gathered there. The about 350 Indians were encircled by soldiers and were supposed to give up their weapons and then get confined into a restricted area of land. When soldiers were about to start disarming the Indians, tensions mounted and a rifle shot went off. What followed was one of the bloodiest battles with more than 200 Indians (incl. women and children) and 30 soldiers killed. Back to the peaceful present: They have built a nice loop road following the rim of the canyon and at parts meandering up and down. This provides the tourist with plenty of views up and down from both levels - Very scenic! In addition, the eroding soil has spectacular surface colors - plenty of Kodak moments there. A short stop at the visitor center and at two or three short trails is all I take time for. 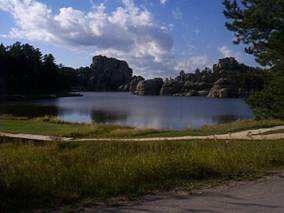 After all, I have additional plans, now that I am here in the SouthWest corner of South Dakota. 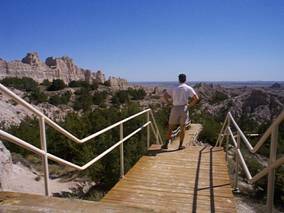 I continue west to Rapid City and on to the famous Mount Rushmore National Monument about 30 miles SouthWest of Rapid City. 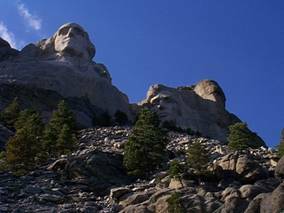 There the heads of 4 american presidents have been sculpted into the rocks, each head some 60 feet tall - the quintessential landmark! Of course, a flood of tourists. After the airport-like reservation traffic at Denali NP in Alaska this is the second busiest National Monument I have ever seen. Hundreds of photograph taking tourists (just like myself ;-), dozens of tour-buses, huge parking lots, enormous visitor center, open air theater, the entire mountain is illuminated at night with massive lights, quite a spectacle. The mountain is about 500 ft tall or so, you can walk up to the bases where there are tons of blocks which had fallen away in the process of building the sculptures. Even though there is so much traffic, I still like it. They staged this walk, kind of a gallery, and stone pillars with inscriptions showing all 50 of the United States, topped by the flag of that state - it is a place full of history and historic achievement. Each of these 4 presidents (Lincoln, Washington, Jefferson and Roosevelt) is considered one of the greats due to extraordinary accomplishments (such as the declaration of independence). I buy T-shirts for Sarvenaz and Philip, continuing our tradition of one T-shirt for every visited state in the US. 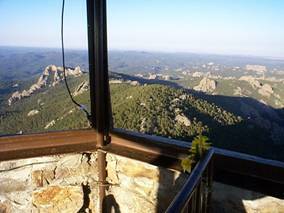 I discover on the map that nearby they have respectable mountains, among them the Harney Peak, with 7245ft (2200m) the highest point in South Dakota! I ask about hiking trails and soon I am told the directions to the trail head at a nearby mountain lake. It is already 5:30 pm and the shadows are growing longer. But I only have this one evening! So without further ado, I am already driving up the winding roads to the lake. A beautiful place it is, one could easily spend 1/2 day just here at this lake. just to get in and park there! Anyway, I get to the parking lot at 6:00pm, just in time for many people to leave there. At least no problem to park... I grab the essentials (water, cloth, camera) and start speeding up the trail - the sign says 6 miles round trip, allow 4-5 hours! In 2 hours the sun will set, 1/2 hour later it will be pitch-dark. Anyway, not knowing how long it will take, I just figure I hike up for 1 hour and be prepared to turn around to not get caught by darkness. I basically do a speed ascent, with running the flat parts and the few downhill sections. 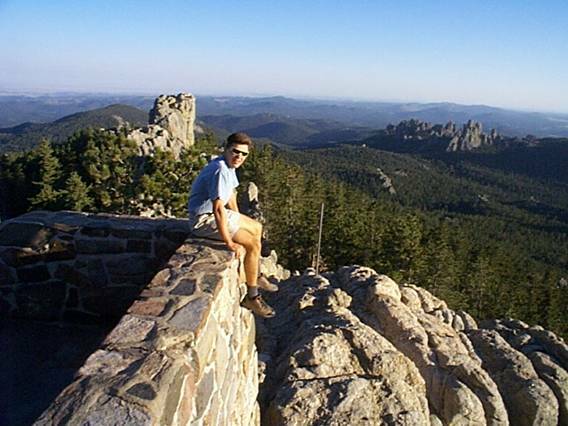 55 minutes later I top out to what can only be described as one of the most spectacular vistas I have seen in a very long time: As you hike up through the dense woods of the Black Hills State Forest, you literally don’t see much until you reach the very top. So I'm thinking: You can go hiking some nice mountains on the same day you get out of bed in Fargo, except you have a 10 hour, 650 miles (1000km) approach drive! I get down to the car at dusk. A few more miles down the road and it is dark. The stars come out against a blue-black, moon-lit night sky. Not long after I see a deer at the edge of the road, the car in front of me almost hits another deer crossing the road. This is not a good time and place to drive fast, so I am slow and careful. Once I stop to take in the ghostly scenery of a nearby lake shimmering in the moonlight. This would be a nice place to spend a couple of days. For hundreds of miles all around there are just dry plains with no trees, but as soon as there are some mountains causing more rain, there are trees - here the splendid ponderosa pines of the Black Hills State Forest. At a local detour caused by road work I look out for a place to rest. I find a nice spot somewhat secluded from the main road at an opening leading towards a farm house. I park at the side of the road under some trees about halfway between the main road and the farm. I flip back my back seats and roll out the blanket I brought from home for this purpose. No time for dinner or anything, just brush the teeth and call it a day. I stretch out after a long day in the car and gaze at the milky way of the clear skies up here in the mountains through the back window of my car turned cabin for the night. It starts getting cold, all the way down to 42 F (5 C)! So I wake up every now and then as it’s a bit too cold for the blanket... I should have brought a sleeping bag! The good thing about sleeping in the car is that it takes about 3 minutes to get going in the morning. I all but have to crawl to the front and turn the ignition. Rolling down the windows I get a breeze of cold air to wake up. On a weekend like this you don't want to waste a single hour of daylight! So I start driving northwest towards my next goal: The Devils Tower National Monument in Wyoming. About 100 miles of landscape go by in the beautiful morning light. I see a motor-powered paraglider taking off and heading for the nearby hills. It is true that the first and last hour of the day are the most picturesque. With clear skies like this it is truly spectacular. 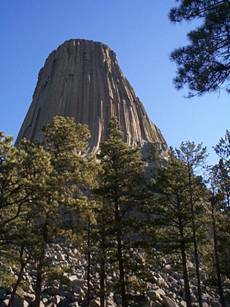 Soon I cross the state line into Wyoming heading for their signature Monument: The Devils Tower was the first National Monument of the US. It is a testament to some ancient volcanic activity, with molten magma flowing up mostly underground, without major eruptions, then cooling and crystallizing. Over the millions of years the surrounding soil has been washed away leaving the much harder volcanic rock exposed to the elements. Naturally, erosion is pounding away at this maybe 800 ft high block of lava rock. Every couple of thousand years, a big chunk falls off and now lies beneath as huge hexagonal blocks, like a giant’s toy block world. 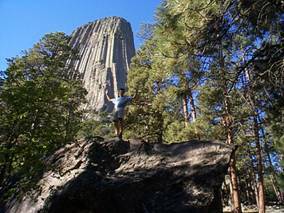 Amazingly, the Devils Tower is an ideal playground for rock climbers - watching climbers is one of the attractions for tourists here! They built a nice paved path around the base to walk around the tower. You could even do this trail in a wheel chair. So you get to see the tower from all sides and occasionally the path comes touching the basis of the tower. It feels like walking up to El Capitan in the Yosemite NP, albeit on a much smaller scale, maybe 1/5 the size or so. Picture the top of Half Dome in Yosemite NP (California) cut off and moved into Monument Valley in Utah, minus all the other towers - then you have a good idea of the Devils Tower in Wyoming. Back in 1941 a champion parachutist landed on top of the tower; it’s flat about the size of a football field! He then got stuck up there for 6 days. Climbers across the nation came to his rescue, which grew into a big event with lots of press coverage. Nowadays, a champion parachutist would probably do another (BASE)jump with a second chute down the vertical north face. But its 11:00am and I still have 1000km to go today! For a moment I think about a little detour to the North, as the state line of Montana is very close (less than 20 miles). However I decide against it due to the small and possible gravel roads there and drive back across to South Dakota, as I need good highways to be able to travel at reasonable average speeds. So I refuel once again, then hit the road and set the cruise control at 75 mph. The next leg is the so-called "Canam" (Canada-America) highway 85 due north from Rapid City. These next 250 miles or so remind me a lot of the desert Southwest, so dry and brown is the prairie here. Even pictures of Morocco fly by as I cruise along the 30 mile straight-aways with the road lost on the heat-glimmering horizon. The temperature climbs up to 96 F (32 C), some 54 F hotter than 8 hours ago! Good thing I have air conditioning now! For a moment I picture myself traveling the Canam with a bicycle - crazy in this heat, when it already seems never-ending in the comfort of a car cruising at 75 mph! Occasionally I get almost blown off the road by oncoming trucks with oversized loads of hay on their back. Eventually I reach Interstate 94, where I will need to turn East to head back home across North Dakota all the way back to Fargo. 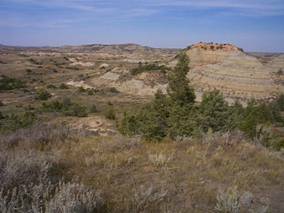 However, sort of as a good rest for the long drive, this is very close to the Theodore Roosevelt National Park only a few miles to the West. I stop at the Painted Desert Visitor Center. The view is very similar to the Bad Lands NP. 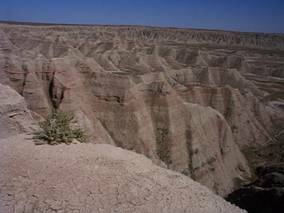 In fact, they call this type of eroding canyon landscape generically the bad lands of South and North Dakota. So I take the last two pictures my digital camera holds. I could go further West and enter the center of the NP to follow a 35 mile loop road - maybe another 1 1/2 hour drive roundtrip. I decide against it, in favor of a 1 hour hike down the canyon along the Painted Desert trail with some side trails. It is pretty hot, think Grand Canyon, just 1/10 of the size and without Colorado River at the bottom! As a curiosity aside, there is a lone bison (buffalo) standing several hundred feet to the side of the trail. For the entire hour, the animal stands there without moving much, probably regurgitating. I detour from the main loop to climb a red-colored pinnacle close to the bison. It's a pretty impressive animal - it must have been quite a sight to see herds of tens of thousands of these grazing the Great Plains. Theodore Roosevelt is quoted in the visitor center with saying that it is one the saddest testimonies of mankind to have (nearly) wasted the abundant riches of the bison herds. It is 4:00pm when I get back to the car and start the fourth and final leg due East home to Fargo. It's another 310 miles. I only stop once for fuel. In the near non-stop (or should I say: no-nonsense-stop) mode of this weekend I only stop at gas stations (and NPs ;-) to buy some snacks and water, Gatorade and/or coffee while refueling the car. Eating and drinking is done while driving, of course. I am amazed myself that I don't tire of these long hours behind the steering wheel. But then again, I have perfect conditions; sun from the back, tail-wind and clear skies, so its spectacular sight-seeing all the way. I cross the Missouri river again like yesterday, quite a mighty stream up here already.